Because acne is such a bothersome, yet common, affliction it seems like everyone has their opinion on what will clear your acne and what will make it worse. But how do we know what is fact and what is fiction? We did the research for you and found these five popular beliefs about acne to be nothing more than myths. It seems like it would be a logical conclusion that if an infection in a wound is cleared by washing it and keeping it clean, an infection of your pores would be cleared the same way. But that is not the case. Pores on your face do not get infected from the top down. 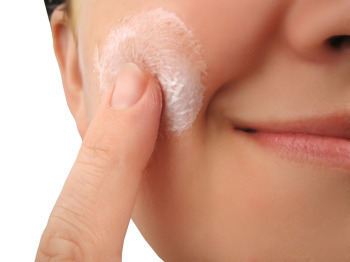 Rather the walls of the pores stick together deep within the skin, starting the formation of acne. In fact, washing your skin more than two or three times a day can actually be worse for your acne rather than make it better because the harsh scrubs can irritate your pores and cause them to become clogged. As much as you’d like to blame your breakout on that horrible math test you had, we hate to tell you that stress probably isn’t the main acne instigator. But this is a good thing, because believe it or not, stress is much harder to control than acne. Even though stress can have an effect on hormones which theoretically trigger acne, there are many effective acne treatments out there that have much more power over your skin than stress does. So rather than stressing about the guilt you’re feeling about stressing, invest your energies towards finding an acne treatment that is going to work harder than those hormones. Who hasn’t been frustrated by a sunburn only to realize that it has “made your acne go away?” But the truth is, that even though your acne might seem to be magically healed, excessive sun exposure does, in fact, make your acne worse. Because a sunburn makes your skin redder, camouflages the redness of acne, and makes your skin slightly swollen the bumps look less noticeable, which could lead you to believe that frying your skin in the sun will be worth it. But don’t believe it! Sunburns aggravate the skin and any aggravation is going to irritate the pores to the extent that you’re almost guaranteed a breakout or two throughout the healing process. There needs to be more research done in this area before we can make a conclusion. Even though we have found no conclusive acne triggers within all of the modern society’s diets, there have been some indigenous populations that seem to be completely exempt from the evils of acne. Although this might be because their diet is different from a modern person’s diet, it is most likely due to a specialized genetic strain. But if you are killing yourself by cutting out all sugary or greasy foods from your diet solely because you think it will help you clear your skin, we can tell you right now that you’re wasting your efforts because all the clinical studies have proven these old wives’ tales wrong. As tempting as it is to pop a pimple that seems so large and noticeable, the only thing you’re doing is ripping the skin around the pore and pushing the infection deeper. Your body is well equipped to absorb all of its white blood cells that you get even in the biggest zit. By popping them, you risk a deeper infection, more inflammation, a bigger scab and even scarring that could last forever. Hopefully this myth debunking will help you better understand your acne and how to deal with it, but just remember that even though acne seems like it will never go away, there are many treatments out there that are designed for all different acne types and one of them is sure to work for you.